Would you consider wearing someone else’s dirty socks? Probably not. Then why would you stand, sit, or lie down on a communal mat at your local gym, or Yoga studio? Mats collect sweat, dirt and dust. 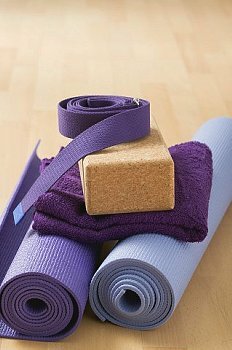 In a very busy studio, or health club, it’s not likely that Yoga mats are cleaned on a regular basis. The surface of a borrowed, or rental, is “one size fits all”. You might slide all over the mat because the texture isn’t sticky enough, or maybe it’s not long enough for your height. You may need a thicker mat, if your back or knees feel uncomfortable. You can get warts from a communal mat. You can get athletes foot from a communal mat. A mat, block, belt or foam wedges are personal pieces of equipment, bearing your own energy. Yes, inanimate objects collect the energy of their owner. Some people carry energy that isn’t healthy. All mats are not created equal. When you purchase your own mat, you can select the size, texture, color and thickness, that’s just right for you. Using your own mat enhances your practise because you’ve selected the right texture, thickness and size. Using a communal mat is like wearing a pair of communal socks or shoes. If you’re repulsed by the thought of wearing communal dirty, then you should feel the same way about communal Yoga mats. Cleaning your own mat is easier than you think. You can put it in a washing machine in cold water for a very thorough cleaning. You can also buy a mat cleaner for a quick clean up right after class. Some mats are chemically treated to prevent the growth of bacteria and viruses. If you’re chemically sensitive and are using a communal mat, you won’t know the difference. Posted on February 23, 2013, in Exercise and tagged athletes foot, communal yoga mats, warts, yoga equipment, yoga mats. Bookmark the permalink. Leave a comment.